Haryana Canal and Drainage Act, 1974, S.24–Restoration of Water Course—As per latest inspection report conducted in presence of both the parties there was water course which has been running from last 20 years which has been demolished-Therefore, such water course falls within ambit of water course ‘by prescription of law’—Thus, orders of restoration of water course are justified and hence upheld. Comments Off on Haryana Canal and Drainage Act, 1974, S.24–Restoration of Water Course—As per latest inspection report conducted in presence of both the parties there was water course which has been running from last 20 years which has been demolished-Therefore, such water course falls within ambit of water course ‘by prescription of law’—Thus, orders of restoration of water course are justified and hence upheld. Haryana Canal & Drainage Act, 1974—Water Course—Restoration of—Both the parties have mutually agreed that the watercourse will remain to continue, therefore the petitioner is estopped from filling the writ petition for setting aside order of restoration. Comments Off on Haryana Canal & Drainage Act, 1974—Water Course—Restoration of—Both the parties have mutually agreed that the watercourse will remain to continue, therefore the petitioner is estopped from filling the writ petition for setting aside order of restoration. Petitioner himself stated he would not open the water course as shown in map because he had given other water course from East to west-He further stated that he will not open the watercourse which is on the middle gate of East West direction as that water course is in his possession-All these factors lead to an irresistible conclusion that the water course was in existence-Orders of authorities upheld. Comments Off on Petitioner himself stated he would not open the water course as shown in map because he had given other water course from East to west-He further stated that he will not open the watercourse which is on the middle gate of East West direction as that water course is in his possession-All these factors lead to an irresistible conclusion that the water course was in existence-Orders of authorities upheld. Canal and Drainage—Doctrine of resjudicata, would not be applicable to order passed by canal authorities. 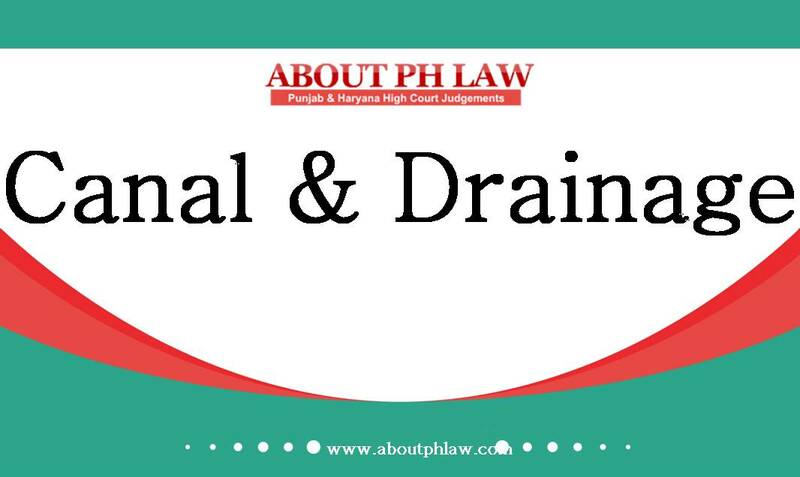 Comments Off on Canal and Drainage—Doctrine of resjudicata, would not be applicable to order passed by canal authorities.